Production waste is just… so wasteful, right? Both from an environmental and economic perspective. While it is nearly impossible to eliminate scrap completely, it is possible to largely reduce it. In this blog article, I tell you how we managed to reduce our scrap rate by 50% in our production site in China. Reducing our scrap rate is one of our key areas in achieving Operational Excellence. Operational Excellence is our leading star in continuously improving our organization’s work processes to serve our customers with high-quality products and valuable services. This is a mindset that requires long-term investments and engagement by employees across our entire organization including all production sites. Before we jump into how we managed to reduce our scrap rate, let us sort out what scrap rate is. Scrap rate can be used as a KPI (Key Performance Indicator) to measure the quality of the production output in a specific manufacturing process. In a production site, a certain amount of scrap is inevitable; it is a natural consequence of the manufacturing process but should be detected early in the manufacturing flow. Scrap is mainly derived from units that are rejected somewhere in the production process. It often has a monetary value and is usually recyclable. High scrap rate can be related to several issues. It can be a matter of poor raw material input, machinery or operating issues and inefficient production setup procedures. At Elos Medtech, we constantly strive to reduce our scrap as well as other waste as much as possible in all our production sites. All raw materials such as metals and plastics are sorted for recycling as well as other waste such as cardboard, paper, and wood. We have contracted certified service providers for appropriate disposal such as incineration or recycling. We also have internal processes to recycle supporting production materials such as oil and water. Our target is set to an annual reduction of scrap rate of 20 percent. In 2018, we actually exceeded our target in our Chinese production site reducing scrap rate with over 50 percent. So, how did we manage to do that? Well, first of all, we started to outline and analyze each step of the production process. 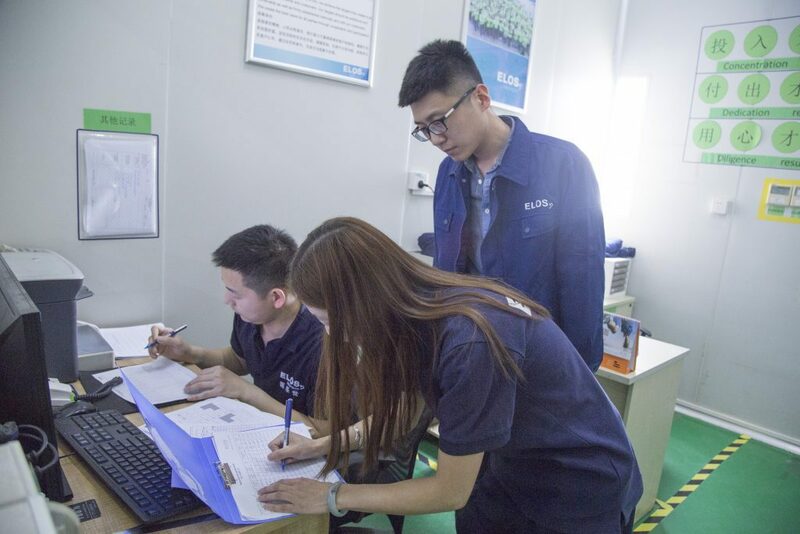 In our production site in China, we produce mechanical components for Novo Nordisk’s reusable insulin pen, NovoPen – the world’s most used durable pen device by patients with diabetes. 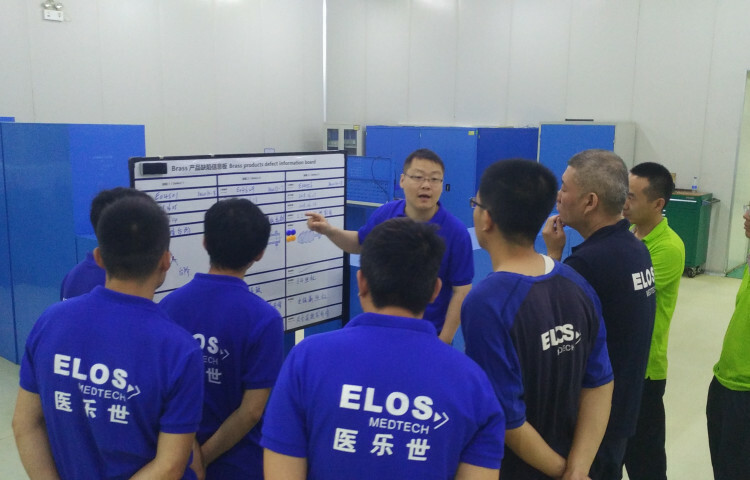 As in all Elos Medtech factories, quality is a cornerstone of our Chinese production site. Over the years, we have advanced our expertise and production processes to produce high-quality mechanical components. Based on lean management, both failure modes and potential improvements are identified and handled during the production process. However, to further improve our production process with a focus on reducing the scrap rate, we established several strategic and systematic enhancement processes. To ensure our business performance was kept at a long-term, solid, and healthy level, the management team set up a clear target for improvements. The targets were broken down per customer, product, and process. By investigating and analyzing the defects of each rejected product, we could identify a number of actions to improve our production processes as well as product quality. We focused on process control measures to ensure the output of our production process was consistent and stable with a desired level of performance. We strengthened the implementation of our NCR (Non-Conformity Report), improved non-conformity procedures, and strengthened the quality mindset throughout the organization. We also analyzed all units related to the production process – from management, product appliance, and equipment issues to material and environmental issues – and communicated production and engineering changes throughout our supply chain and to our customers. We improved our training for everyone including programmers and operators and each of the employees were very engaged in the process and made a great effort to reduce our scrap rate. Our MRB (Material Review Board) team also played a significant role in improving our production processes, with daily follow-ups as a new standard routine. Continues improvement projects in the whole organization as part of the daily operation in the factory. As you already know, the results were remarkable. Exceeding our target and cutting our scrap rate more than half was more than we initially expected. At Elos Medtech, we are fully committed to improving environmental performance across all of our business activities. We recognize our key impacts related to not only scrap but also emissions, transport, and consumption of energy, raw materials, and water. We will continue to measure our business operations’ impact on the environment and set targets for continuous improvement. How do you value a production partner’s ability to keep the scrap rate at a minimum? Let me know in the comments! Or just share your thoughts on my blog post, which I hope was somewhat helpful in how to understand and reduce scrap rate. For any further questions, please visit our website.